This is current implementation used in JaHOVA OS, so if you read Part 1 of the series then you know this will not produce the results we are looking for, but it is still worth discussing. On the surface this seems like the easiest architecture to implement While getting everything up and running is a bit on the trivial side, getting each sub-system to play nice with each other is very different story. The major advantage of this architecture is the sub-systems do not require any re-work. You can implement the same serial execute sub-systems and drop into a multi-threaded environment This is the biggest draw to using this layout. But as you already probably know, if you simplify one thing, then you are probably complicating another. Due to the way WebWorkers communicated, copies of world/entity data had to be sent to each sub-system. The sub-system could therefore make any changes/updates to the dataset and then return it back to the main application to by synced to the "master copy". The issues comes when two sub-systems want to modify the same data set, which has priority? In small systems, this is not a huge issues, but as the complexity of the scene increases keeping everything synced can become an issue. One way around this is to only allow specific subsystem to update specific datasets. This prevents the syncing conflict issue as no two sub-systems can update the same piece of data. This was the approach taken with JaHOVA OS. The second issues this implementation brings is expandability. As of this moment 4 and 8 core machines are becoming common, but 12, 16 and 32 core systems are on the horizon. Wouldn't it be great if software actually utilized all of the power afforded it by the hardware? 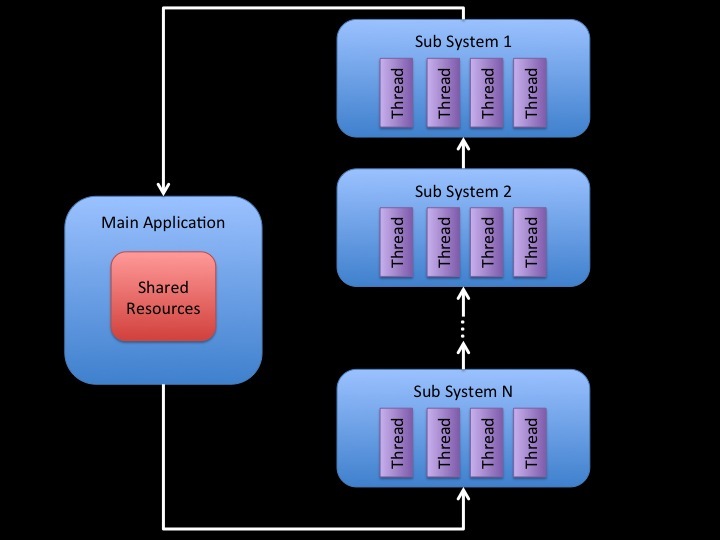 With this implementation you have no expandability, if you have 4 subsystems, you use 4 threads. It doesn't matter if the hardware only has 2 cores, you will run 4 threads. Conversely, if the system has 8 cores, you still only use 4... I think we can do better. As you can probably guess, this is one of the biggest downfalls to this implementation It requires you to rewrite any serial driven sub-system into an equivalent parallel processed system, not a trivial task. The greatest advantage to this implementation is the removal of memory syncing issues. 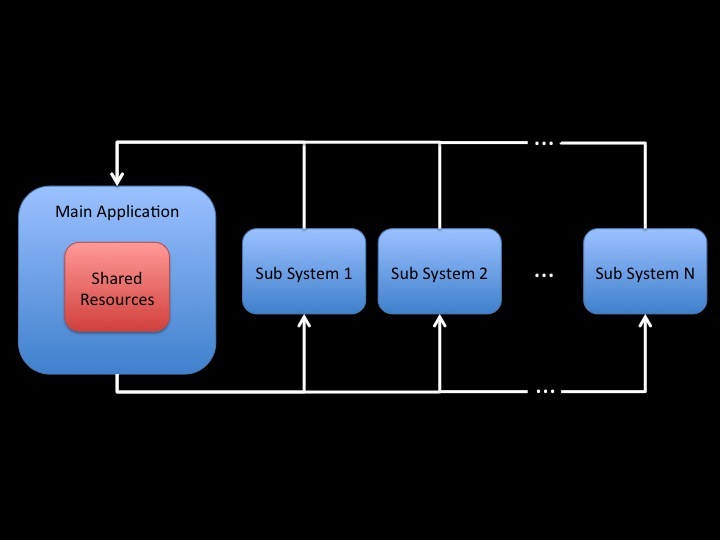 Since each sub-system is executed serially, no two sub-systems will try to update a shared resource at the same time. This completely removes any need for Critical Sections or Mutex controls in your code. A major Win! Since each sub-system can generate as many threads as required for execution, this design should allow for expandability to utilize higher core systems efficiently. While Option 2 shows great promise and is actually a common architecture used in production for other languages, it still left a bit to be desired for what I was looking for. One of the main issues I have with Option 2 is that all control of optimization exist in the Sub-System. I suppose this is not an issue if you only plan on using your own sub-systems, but if you plan to allow extensibility for others to add 3rd party sub-systems you are giving quite a bit of control over to that 3rd party system. I would rather the control rest with the main engine (GEn3CIS) and the sub-systems request execution on the engine. The serial execution allowed for all resource syncing issues to be removed, but is it overkill? If one sub-system is completely done executing on a portion of a dataset, why should a second sub-system have to wait for a non related/blocking process to complete before it began execution? I would prefer to see an architecture that could be simplified to Option 2, but allowed for expandability to allow non-blocked processes to begin execution. 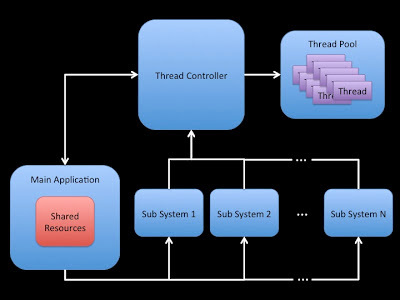 In its simplest form, the Thread Controller can collect the request from each sub-system and execute them one system at a time, which gives the same functional execution as Option 2. 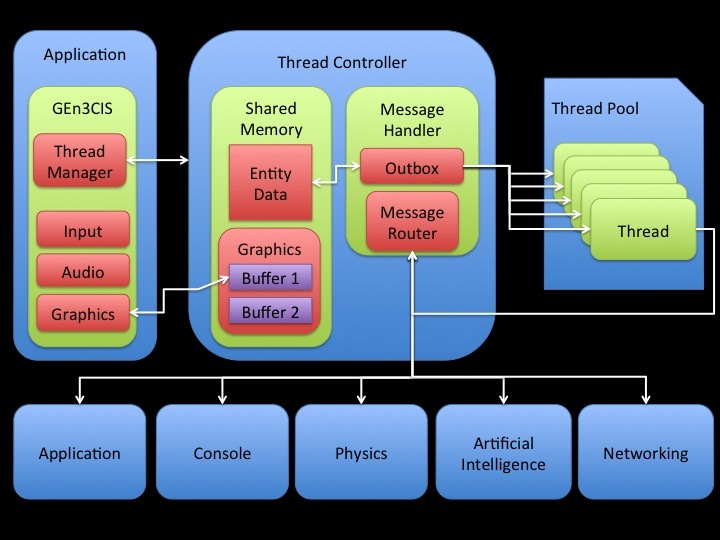 But now that other systems have already queued request to Thread Controller, it now has the ability to begin executing request from waiting sub-systems if they are no longer blocked based upon memory access. This gives the control back to the engine (GEn3CIS) while also limiting idle time. 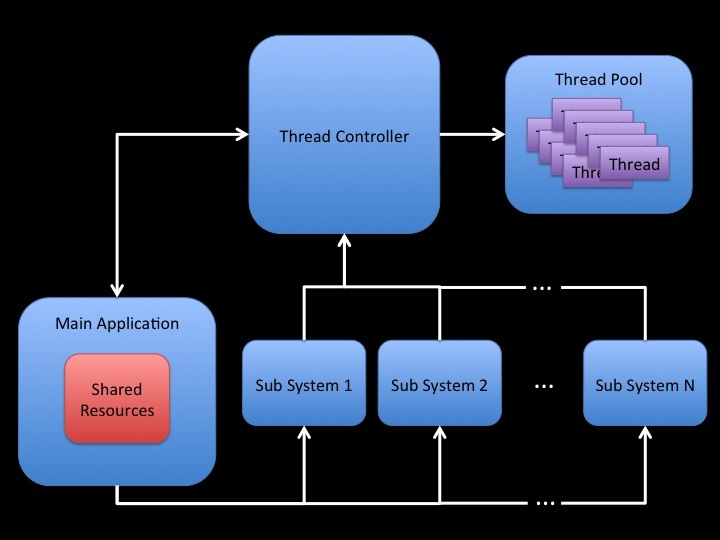 This design also allows for complete control over thread creation and therefore can make sure that every sub-system takes complete advantage of all cores available on the given hardware platform. Intel created a paper on "Programming a Parallel Game Engine" that shows has some similarity to the design shown here as well. How many WebWorkers can actually be run at once? Is this just going to crash browsers? At this point I feel these are all very valid questions. I have done some background performance testing which as mentioned in Part 1 was presented at various conferences, check the presentations out if you want to dive deeper, but I have a recap below trying to answers some of these concerns. Can WebWorkers Really Handle This? While I dont have a specific answer to this question, I did try creating 10 threads on the fly and using each one to control a ball on the screen. In this demo all of the physics associated with each balls movement is actually be calculated in a thread and sending back its updated position to the main application The main application then updates the ball position (and shadow) on the screen. You can actually run the demo live here. So we have shown the initial architectural design of how GEn3CIS is going to look, but how is it going to work?